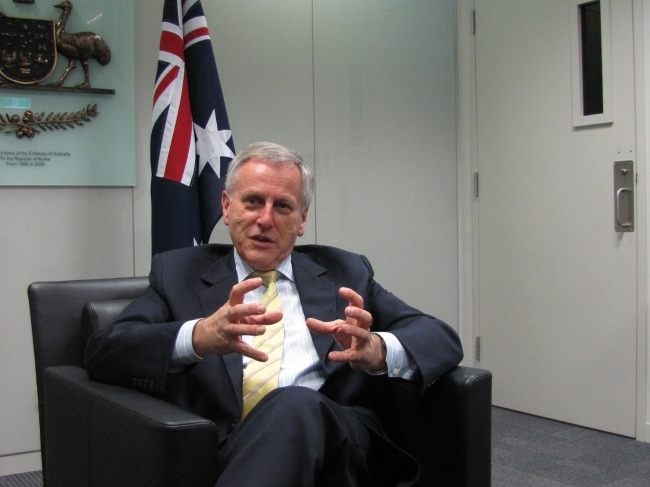 Aussies top ally for Korea after U.S.
South Korea’s security relationship with Australia is second only to the United States, said Australia’s new ambassador to South Korea, underlining recently bolstered bilateral defense ties and setting out his priorities for his posting in the years to come. “We held a ‘two-plus-two’ meeting of the foreign and defense ministers from each side. We had our defense minister and our foreign minister here meet with the South Korean defense and foreign ministers on July 4,” said William Paterson in an interview with The Korea Herald at his office earlier this month. The so-called “two-plus-two” meeting on security issues brought together Foreign Minister Yun Byung-se and Defense Minister Kim Kwan-jin and their respective Australian counterparts Bob Carr and Stephen Smith. Now, Australia can include South Korea among very close security partners. “In the four months that I have been here we did one major step,” Paterson said. The two sides had planned for the two-on-two meet since April 2011. “The only other country with which Korea has a similar relationship is the United States. That has a security focus, but it also reflects the closeness of our relationship. Overall, we are probably South Korea’s second-largest defense partner, after the Americans,” Paterson said. The career diplomat arrived in South Korea to assume his new role as ambassador in May and presented his letter of credence to President Park Geun-hye in a credentials ceremony with other incoming envoys at Cheong Wa Dae on Aug. 8. Australian participants took part in the Ulchi Freedom Guardian joint military exercise in August. Earlier in the year in April, an 18-member army unit also joined a landing drill held near Pohang as part of the “Foal Eagle” U.S.-South Korea joint military exercises. Australia’s participation in the military exercises on the peninsula is significant because although Australia is a member of the 16-nation United Nations Command and fought alongside South Korea during the Korean War, no other U.N. Command member state has ever participated in joint U.S.-South Korean military exercises. Both South Korea and Australia were elected to the United Nations Security Council in October 2012, too. The U.S allies can thus also cooperate on shared security interests in Asia on the world’s most important multilateral body on such issues as pressuring North Korea on denuclearization, piracy in the Indian Ocean, and drug smuggling and weapons trafficking in Southeast Asia. The newfound zeal in bilateral and multilateral security cooperation can be traced to a security pact inked when then-President Lee Myung-bak met with Prime Minister Kevin Rudd in Canberra in March 2009. While important, the Australian-South Korean two-plus-two confab is hardly unique. The two-plus-two dialogue format, although traditionally the purview of longstanding Australian strategic partnerships, includes a number of other countries. For Australia that means the U.S., the United Kingdom and Singapore. Australian foreign and defense ministers have been meeting their U.S. counterparts at an annual Australia-United States Ministerial Consultation since 1985; the United Kingdom starting in 2008; and Singapore, under the auspices of the Singapore Australia Joint Ministerial Committee, since 1996. In September 2012, Australia and Japan held their fourth Australia-Japan two-plus-two Foreign and Defense Ministers Meeting and Australia and Indonesia held the second Australia-Indonesia Annual two-plus-two Dialogue in April. Paterson also outlined important areas in the bilateral relationship that he would pay keen attention to through his multi-year posting here, such as people-to-people exchanges and the start-stop negotiations for an Australian-South Korean free trade agreement. There are now around 25,000 full-time Korean students in Australia and the Korean community at around 150,000. Korean students look to Australia as a great place to study abroad, improve their English and vacation. The two countries have been in successive rounds of FTA talks since 2006, but failed to reach a deal by the end of 2012, despite commitments given by former leaders Lee Myung-bak and Julia Gillard of Australia. Farm groups in Australia applied pressure on Gillard to clinch a deal in 2012, but politicians in Seoul were still recovering from the domestic tumult caused by its far bigger U.S. free trade deal which has since come into force. At $36 billion in two-way trade in 2012, South Korea is Australia’s fourth-largest trade partner, but Australian imports in South Korea are levied $1 billion in duties, five times the levies imposed on Korean imports to Australia, according to the Australian embassy. “An FTA is critical for both countries to ensure more choice and lower prices for consumers and to enlarge the market for our companies,” Paterson said. Korean experts close to the talks say a deal is tantalizingly ― albeit also frustratingly ― close, as sticking points remain. Two important issues for Seoul are Australia’s insistence on dispute arbitration and beef. Australia-South Korea free trade talks went into hiatus again as South Korea held its presidential election in December last year. With the election out of the way, the two countries are back to the pending business of the FTA talks. If Paterson can play a constructive role in successfully shepherding a free trade pact, it would surely mean a significant accomplishment for the veteran diplomat.